The Benzie-based, honeybee-inspired business trifecta of Sleeping Bear Farms honey, St. Ambrose Cellars meadery, and BeeDazzled soap and candle shop together compose one of the biggest honey producers in Michigan. St. Ambrose Cellars, the “gateway to the Grand Traverse Wine Trail,” is located at an historic 19th-century stagecoach stop in rural Beulah next to a big red barn on the corner of Pioneer and Homestead roads. Locally grown and locally owned, all of the processes happen here among five buildings: bee raising, pollination, fermentation, beeswax production, winemaking, and tasting of the products. There are non-alcoholic drinks offered, as well, and kids can taste root beers and sarsparillas on tap that are also made with local ingredients such as maple syrup. The complex is the brainchild of Kirk and Sharon Jones. He handles the operations at St. Ambrose, while she “does her own thing” at BeeDazzled, her business at their home on River Road near Benzonia, where she raises bees, grows a garden of bee-preferred flowers (“the bees love Angelica,” observes Sharon), and sells organic bee byproducts like soaps and candles, in addition to things you have never imagined existed, like earwax candles. Sharon believes in the healing powers of these remarkable insects and advocates “apitherapy”—using bee stings to prevent and cure other ailments. Kirk grew up in Royal Oak as the grandson of Finnish immigrants who moved to Detroit from the Upper Peninsula when the mines there closed. His father was an engineer for Chrysler, so the family traveled often, including a move to Europe for a while and later to New Orleans where, as a teenager, Kirk had his first taste of Cajun music and where he first encountered honeybees. Another ‘plate’ that Jones spins is as front man for K. Jones and the Benzie Playboys, founded as a “neighborhood buddies band” in 2000. Kirk was then a recreational guitar player, but before long he had mastered the button accordion and subsequently traveled around to various workshops and festivals to learn the fiddle. The Cajun/Zydeco band now plays gigs all over the Eastern and Midwestern United States. Jones tried out his first mead experimentation on the “boys” in the band. Their reaction: “Man, you gotta bottle this and sell it.” And that is exactly what he did. Kirk fell in love with the bees, a love that evolved into a vocation/lifestyle shared, with his soul mate, Sharon, who reveres bees as he does. While still a high school senior in Louisiana, he told his classmates that one day he would move to Northern Michigan, and they all laughed at him. But after graduation, he followed through on that promise and returned to his “always in your blood” home state. He attended college for a while, although that was not enough for him. In the late 1970s, Kirk became part of the “back to the land” movement, popular at that time. He started out on Covey Road in Honor. His future wife had been living on Spider Lake, and—shortly after the fellow bee-worshippers met—they joined life forces, acquired two hives and some farm animals, planted a huge organic garden, and started a family. Jones sold his first honey crop to Oryana Cooperative in Traverse City. After 10 years, the Joneses had outgrown Covey Road, relocated the business to the Honey House next to the present winery, bought an 1898 home on River Road, and eventually created BeeDazzled next door. In 1984, the couple refurbished the old barn on Pioneer Road and built the new facility. Today, six additions later, St. Ambrose Cellars will soon be home to a microbrewery, in addition to the winery/meadery. All of the equipment is in place, paperwork completed, and the projected opening is for early fall. Early in their bee production, Kirk experimented with mead, an alcoholic beverage that dates to ancient times and is found all over the world, from northern Scandinavia to southern Africa. The word is derived from almost every conceivable language root, so popular was the drink. The percentage of alcohol might range between 6.5 and 20 percent or more, and the beverage is created by fermenting honey with water, sometimes with various fruits, spices, grains, or hops. It may be carbonated, still, sparkling, dry, sweet, or semi-sweet, but its fermentable sugar comes from honey and, as we all know, honey comes from bees. A St. Ambrose special concoction, the “Black Madonna,” taking its name from a mythical Lithuanian tale, is a citrusy mead that is fermented with blackberries and probiotic bacteria. The Betsie Current’s taster—more of a wine appreciator than an avid mead-head—found it to be delicious, but it does not replace the excellent St. Ambrose wines, all made from Michigan grapes. Ambrosia, fragrant and pleasing to the palate, was called the “food of the gods” in classical mythology, and one can see why, here at St. Ambrose Cellars. This wine is fantastic. The Joneses researched extensively to name the facility. They were looking for an identity. The logo for St. Ambrose Cellars was based on two icons: St. Ambrose himself, the Milanese patron saint of beekeepers and candlemakers, and Melissa, meaning “bee,” herself an ancient goddess whose image Sharon found in the British Museum in London. The result is a perfect mesh of male and female, which is the image that adorns the assemblage of buildings at the Cellars, beneficently welcoming you, the browser and the taster. Tasting and talking, storytelling and conviviality, meeting new people, eating and drinking—all of this was in the tradition of the mead hall (think King Arthur) in the Old World. An all-purpose large building, a single room, a festive gathering around a long and tall wooden table begets the scene set 1,000 years ago. “Mead implies the gift of poetry and sweetness of conversation,” reflects Sharon. Meeting new people in one friendly space—the hall, or, in this case, the tasting room—results in the cheerful ambiance that brings visitors to St. Ambrose. The gathering table comes from wood that was found in the swampy waters off Apalachicola in Florida and rescued by a friend, taken to a mill, and rebuilt. If Sharon thinks the business all comes down to the bees, Kirk would add that it is part of community—kinship and fellowship, identity and local involvement. St. Ambrose Cellars hosts meetings, weddings, special events, “Sip ’n Dab” (tasting and painting) and is open seven days a week all year long. There are 40 employees, and turnover is low. There are beekeepers, honey harvesters and packers, administrative, personnel, sales, shipping, accounting, tasting room and kitchen staff, maintenance, grounds and inventory personnel. The Joneses’ daughter, Winona, is the coordinator for weddings and other events, and the business has hired a winemaker, Matt Frollo, who has been trained by three different winemakers. There are two tasting-room managers and a culinary degree holder handling the paninis and other tasty food offerings. Alfredo Improvisational Quartet is the house band, and there is usually live music on weekends. This is such an entertaining and enjoyable place to visit, where everyone is either tasting and socializing or bustling about with Jones-like energy and enthusiasm—as busy as… well… bees. Mark your calendars for Saturday, September 10—“The Crush,” an annual celebration of Benzie County, hosted by St. Ambrose Cellars. 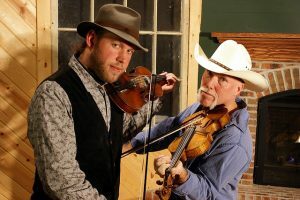 Visit them online at StAmbroseCellars.com, in person at 841 Pioneer Road, Beulah, or call 231-882-4262. 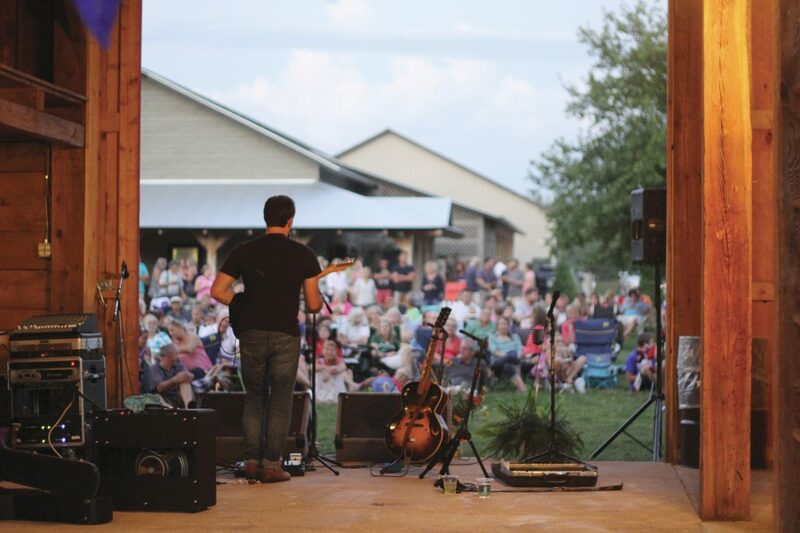 Photo: Nationally famous musician Joshua Davis plays an al fresco concert in the St. Ambrose Cellars barn to a captive audience. Photo by Aubrey Ann Parker. Food-glorious Food Trucks Where Are the Workers?